Clover Park Technical College (CPTC) is an excellent choice for active-duty, transitioning and veteran servicemembers wishing to further their career dreams. "We offer an umbrella of services to help this important population of students to succeed in their chosen career field," said Jen Weinmann, the college's workforce development faculty counselor. Home to about 4,000 undergraduates, CPTC offers a diverse array of courses designed to provide its students with the qualifications to begin well-paying careers. "My office is a ‘one-stop shop,'" Weinmann continued. "We offer admission, financial aid, federal student aid (FAFSA), joint service transcripts review (JST), class registration, and other resources to help students succeed." The path to continuing education begins at Joint Base Lewis-McChord with a briefing on the VIE 25 program. The initiative -- which stands for Veterans Industry Education -- connects servicemembers with career credentials during their last six months of military service so they can qualify for in-demand jobs upon separation. Thought to be a first in the nation, the program is a close collaboration between local community and technical colleges, state agencies and the Armed Forces. The number 25 refers to the community and technical colleges within 25 miles of JBLM. Some of the colleges joining Clover Park in the VIE-25 service area are Green River College, Highline College, Bates Technical College, Pierce College and Tacoma Community College. "We work with unit commanders and counselors at the Stone Education Center to provide briefings about VIE-25," explained Weinmann. Once transitioning servicemembers or veterans commit to an educational path at CPTC, Weinmann and others help them to understand and use their VA benefits and their route to academic success. Courses from aviation and engineering to nursing and business are open to veterans. "We help assist with everything from tuition, books and tool kits to benefits, transportation and child care costs," said Weinmann. She also pointed out that an employment security representative is located on campus to help soldiers with unemployment questions. Outside of the help that Weinmann and her colleagues provide, there is also an important resource in the Veteran's Resource Center. 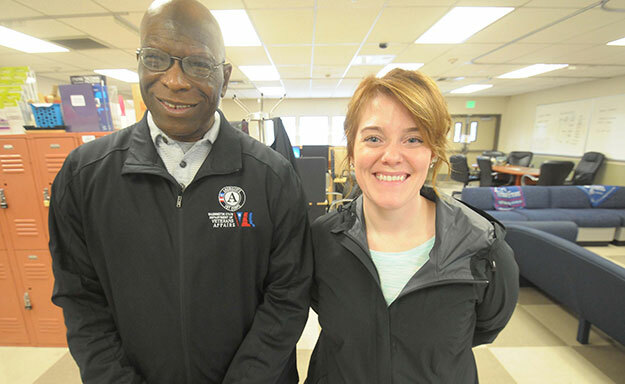 "We provide support to those transitioning and active-duty soldiers who need it," Army veteran NoTrip Dicey III, the center's chief navigator, pointed out. "This means that we help them navigate everything from helping with available resources, classes, and military-related questions to just providing a place to come and relax." To further its commitment to helping active-duty soldiers, transitioning servicemembers and veterans achieve their career goals, CPTC is holding a free veteran resource fair Saturday, April 20, from 9 a.m. to 3 p.m. in the Tacoma Dome. For more information about the fair, visit: nine9line.org. For complete information about the college and courses offered, visit: cptc.edu/veterans. For questions about getting started at CPTC, email: Jennifer.weinmann@cptc.edu. For questions about VA benefits, email: glenda.epps@cptc.edu. For questions about the Veteran's Resource Center, email: veteran.navigator@cptc.edu.